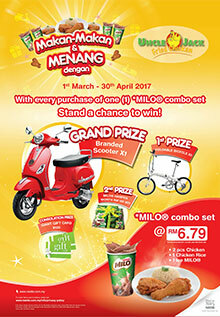 Buy ONE(1) MILO combo set from any participating Uncle Jack outlet in a single receipt. Fill in all required details, including Name, IC no & Contact on the specified column of the printed receipt. Drop off the entry receipt into the official entry box in participating Uncle Jack outlet within the contest period. Visit Peraduan Makan-Makan & Menang dengan Uncle Jack Contest terms & conditions for more details, and check out also the list of participating outlets.